Ostingele system, Placid region. On the 24th of September at 21:00 EVE Standard Time, forces belonging to Pandemic Horde [REKTD] clashed with Snuffed Out [B B C]\Project.Mayhem. [16-13] in the system. The battle was prompted by an arranged fight between Spectre Fleet and Pandemic Horde which was set to take place in the Mantenault system in the same region. Unfortunately, the Spectre Fleet force had been intercepted en route by WAFFLES. [N0MAD] and Snuffed Out\Project.Mayhem. forces in the Harroule system and quickly dispatched, leaving Pandemic Horde in a bind. The Pandemic Horde fleet, a 180 pilot Maelstrom battleship fleet, arrived to the Ostingele system only to find its way barred by the Snuffed Out\Project.Mayhem. 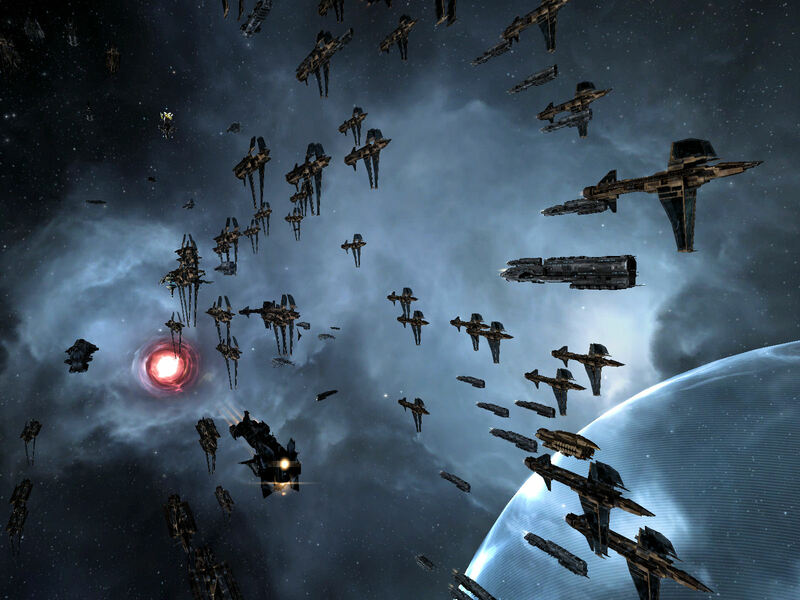 fleet of 140 pilots in Machariel battleships, loitering on the Agoze gate. Not wishing to engage the Machariel fleet without backup, the Maelstrom fleet warped to a friendly citadel in the system while considering its options. Pandemic Horde started contacting possible allies in the area, but most had either stood down, were too far or simply did not have the numbers needed to form an effective fighting force. In the meantime, communication channels were opened between the two opposing fleets’ commanders to discuss conditions for engagement, as the Pandemic Horde fleet was loath to turn back after making this way so far from its staging system. In the end, an agreement was reached for both sides to engage without the use of triage support. The Pandemic Horde fleet warped to the Agoze gate, landing 50 kilometers away from the Machariel fleet and opened fire, thus starting the fight. At this point, opinions differ between the two sides. According to Pandemic Horde, the Machariel fleet commander broke his promise, bringing in 2 Apostle force auxiliaries to the field. On the Snuffed Out\Project.Mayhem. side, they accused Pandemic Horde of breaking the agreement by calling in aide, as several gangs converged on the fight, including a Spectre Fleet electronic warfare wing and a WAFFLES. tactical destroyer gang. Regardless, the 2 Apostles landed on grid and entered triage mode to bolster the logistics wing of the Machariel fleet. In response, Pandemic Horde lit its own cynosural beacon on the field, ushering in a Minokawa force auxiliary. However, it didn’t matter. With more than a hundred Maelstroms on the field, the artillery barrage proved to be overwhelming, with the shells punching through the Machariels’ armor plates and detonating inside the fragile hulls. With each volley, a Machariel instantaneously vanished in a ball of fire, leaving behind only a wreck. The Machariels retaliated, their auto cannons pumping round after round into the thicket of Maelstroms, overloading their shield generators and punching through the weak hull as they burned in to shorten the distance between the two fleets. The Maelstroms did not fancy being overrun by the Machariels, and attempted to pull range, micro warp drives stretching to the limit in vain as the Machariels proved faster. Soon, the Machariels were on top of the Maelstroms, hammering away at them. The Maelstroms returned fire, but at such a close proximity the artillery cannons often had a trouble tracking the fast moving battleships, thus negating some of the fleet’s firepower. Whats more, the Pandemic Horde fleet commander was dispatched during the melee, thus forcing the fleet to disengage and warp off to the friendly citadel in the system to re-group. Rallying on the Citadel, the Pandemic Horde fleet quickly re-formed and warped back to the Agoze gate grid, landing once more at 50 kilometers from the Machariel fleet, which had remained in the spot where it chased the Maelstrom fleet off. Once again, artillery cannons bombarded the Machariels which responded with a hail of auto cannon shells of their own, burning once more into the firestorm. The Maelstroms once more attempted to keep their distance as the Machariels closed in, exchanging fire all the while. By now both fleets had suffered great losses, the exchange proving to be quite bloody. For every 2-3 Maelstroms that perished, a Machariel would go down, and the brutal exchange did not relent for a second. Burning far from their triage support, the Machariel fleet disengaged, warping back to the gate to gather its Apostles before aligning back to the Maelstroms. Once aligned, its force auxiliaries out of triage mode, the Machariel fleet warped back on top of the Maelstroms with its Apostles in tow. The fight resumed in earnest, but by now the losses of the Pandemic Horde fleet were catching up to it. Losing the critical mass of Maelstroms, their coordinated volleys proved too weak to obliterate the Machariels, so many of them were caught by the Apostles in structure and saved from further harm. The Maelstroms then turned their guns on the support ships of the Machariel fleet and some of the gangs which hovered at the edge of the fight, preying off stragglers. They managed to inflict further damage, but it soon became apparent that further fighting was futile and would only lead to a disaster. Thus, the Pandemic Horde fleet commander made the decision to withdraw, leaving the field for Snuffed Out\Project.Mayhem. to claim. As for Snuffed Out\Project.Mayhem., their fleet quickly dispatched the last stragglers tackled before looting the field and extracting to safety, ending the fight. The Battle from the Perspective of the Pandemic Horde Maelstrom Fleet. Battle report for the Ostingele system can be found here. The battle lasted 30 minutes with Time Dilation spiking several times during the confrontation, reaching upwards of 50% before subsiding. The system itself hosted 500 pilots at the start of the fight. Pandemic Horde lost 82 ships in the fight including 57 battleships for a total of 17.39 billion ISK. Snuffed Out and Project.Mayhem. lost 35 ships in the fight including 26 battleships for a total of 34.02 billion ISK. Third parties lost 11 ships for a total of 1.23 billion ISK. I do accept as true with all of the concepts you’ve offered on your post. They’re very convincing and can definitely work. Still, the posts are very short for newbies. Could you please lengthen them a little from next time? Thanks for the post.